Mount Vernon is a lovely Georgian Villa of great charm and interest. Built in 1788 on the Burren coastline of County Clare, the house has fine views over Galway Bay and the surrounding area. 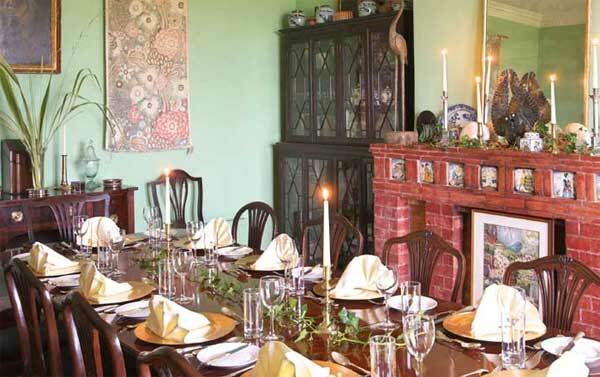 The well proportioned reception rooms contain fine antique furniture, comfortable sofas, paintings and interesting artifacts collected from our extensive travels, all set off by the calm green and gold motif of the rooms. Open fires in the sitting room and library add a warmth and welcome to these lovely rooms. The library opens onto a sheltered terrace and a walled garden of rose beds, herbaceous borders, fruit trees and some immense trees believed to have been a gift from George Washington. There are four extremely comfortable and elegantly appointed ensuite double bedrooms (one with additional single bed) and a further single room with a private bathroom upstairs. The spacious first floor sea view rooms contain super king beds and damask sofas and have stunning views across Galway Bay to the Cliffs of Aughinish. 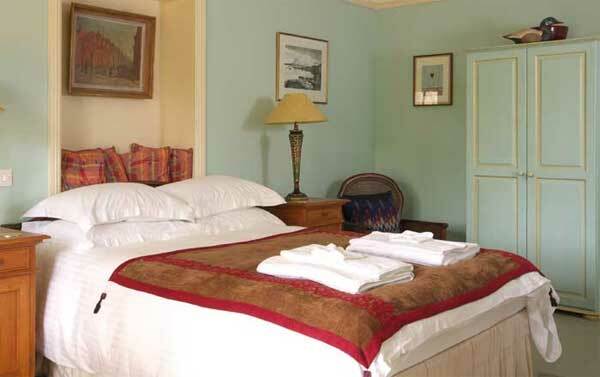 Downstairs two sun-filled ensuite double bedrooms furnished with Ally’s hand painted furniture open onto a flagged terrace in the walled garden. All the beds have modern orthopaedic mattresses with Egyptian cotton bedlinen, goose down duvets and hand- decorated velvet throws. Organic seaweed toiletries and huge fluffy white towels are a feature in the modern bathrooms. A full Irish breakfast is complemented by Ally’s home baking, wild Burren jams and honey. Our organic eggs come from ‘Annie’s Ladies’ up the lane, bacon and sausages are locally sourced and seasonal mushrooms are fresh from the fields. Guests can catch mackerel along the shore to be grilled for breakfast. Sunlit in the mornings, the dining room is at the front of the house overlooking the sea. Guests eat convivially at a single large table in the evening by candlelight with the glow of twilight reflecting off the cliffs opposite and the occasional boat sailing past.